It’s been a few days since my last blog post, and I wanted to assure you that I haven’t been captured by invasives. 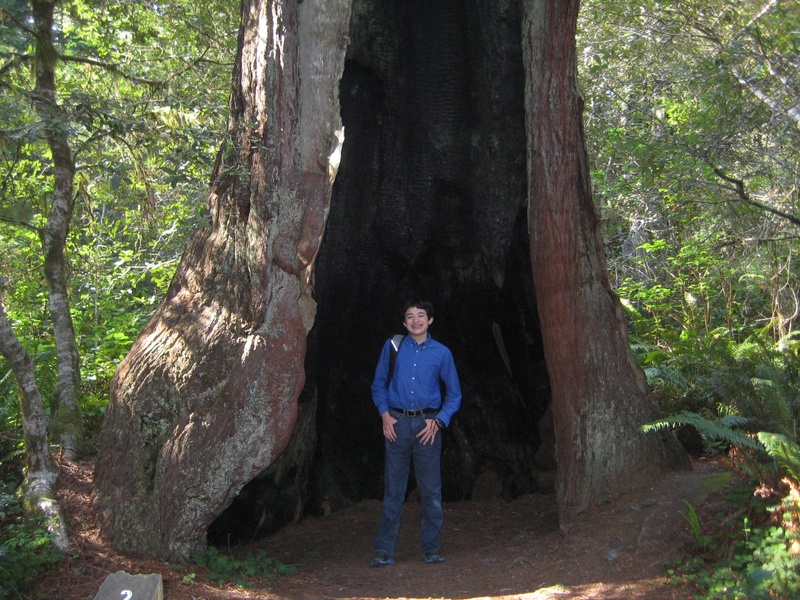 I was in California enjoying the wonderful weather and the giant Redwoods. 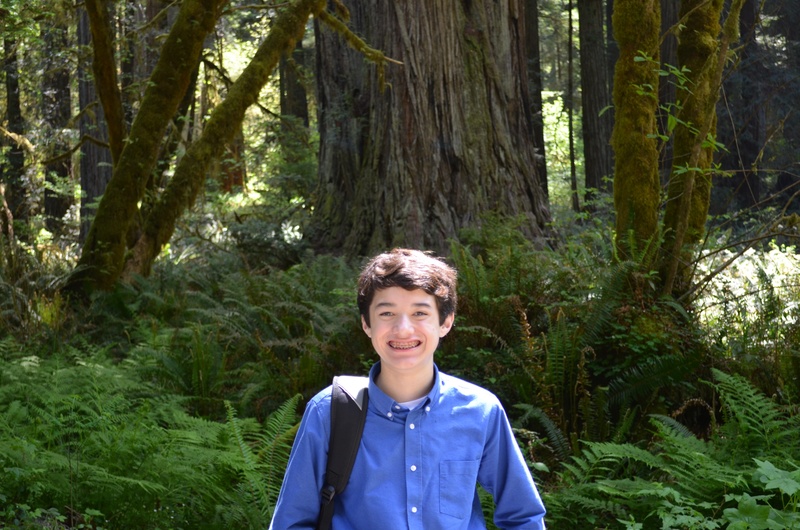 Loving nature, as I do, I really enjoyed hiking the trails through the Redwood trees in the Redwood National Park. I especially liked the Lady Bird Johnson Grove Nature Trail because it reminded me of my home state of Texas and our wonderful Lady Bird Johnson Wildflower Center. It’s amazing how old the Coastal Redwoods (Sequoia sempervirens) can get with the larger trees in the park dating back 600-700 years ago. The giant trees started growing when the Aztecs and Mayans ruled Central America, well before the first Pilgrims arrived from the Mayflower. It’s also shocking how large they can get with some growing over 360 feet. By comparison, my arch nemesis, the Giant Reed (Arundo donax), can grow up to 20 feet. That means that it would take at least 18 of these invasive plants on top of each other to reach the top of one of the Giant Redwoods. (I guess the Giant Reed is not so giant after all!) The Redwoods are the largest trees on the planet. When I was at the lower edge of the trail where loggers had clear cut the Redwoods many years ago, there were no large Redwoods, but there were smaller ones and other fir and hemlock trees that had grown up around the stumps of the older trees. They were starting to work together to build another ancient forest of trees. Redwoods can grow from seedings or from burls at their base. In other areas, it was sad to see some Redwoods so badly burnt, but they were still alive. They are hardy trees, with tannin-rich bark that resists insects, and that’s why they were so coveted by people. The Redwoods like to grow in Northern California because of the climate, the fog, and the heavy winter rains. The fog is important to the trees because they get a lot of their moisture from the fog during the dry summer months. I found the ferns that grew around the Redwoods amazing because I love pioneer plants. They’re one the first plants to come in after a fire or other disasters. There haven’t been any large fires in the Redwoods lately, but the ferns are a key part of the forest ecosystem. 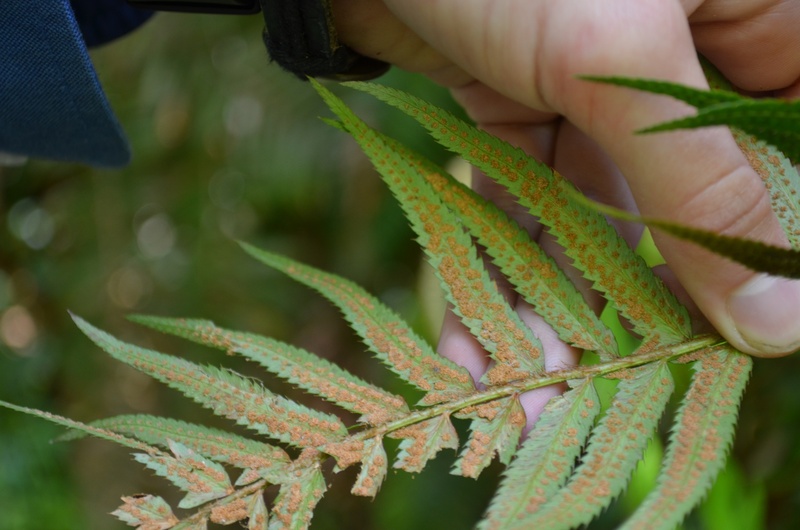 Ferns reproduce by spore instead of seed, and they love the foggy wet weather along the Northern California coast. 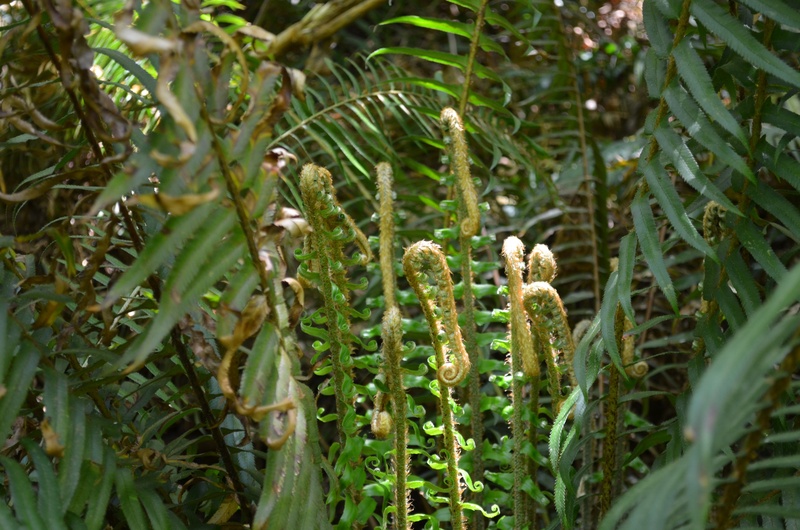 There are many kinds of ferns and without a careful eye, they can look similar to each other. At the National Park Visitor Center, I picked up a book called Pacific Coast Fern Finder by Dr. Glenn Keator and Ms. Ruth Heady. This handy pocket book uses dichotomous keys to help identify ferns. The technique of dichotomous keys asks at least two description questions at each step to help you identify what you’re studying. If the bird has a red chest, go to step 2. If the bird is gray and white, you sighted a Mockingbird. If the bird has brown wings, you found a North American Robin. If the bird is all red, you discovered a male Cardinal. One of the ferns that I saw was the Common Sword Fern (Polystichum munitum). Turning the leaves over, you can really see the sorus, which are clusters of sporangia that bear the spores.